Good news, DC! It looks like the Park Service and Capital Bikeshare have struck a deal to add stations to the Mall. While there are several big questions outstanding still, including location and who will pickup the $23,000 annual maintenance on a bikeshare dock. It looks like the District may pickup the $50,000 in costs per dock, though. 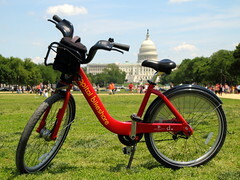 The addition of new Bikeshare stations down on the Mall, a frequent destination of tourists and locals alike, would be a welcome development in a fight that had the District and the Park Service at odds.